I know I'm probably the last person to get hooked on Lost. I try not to watch a lot of tv, but after hearing so much about Season 2 I decided to watch first few episodes from Season 1. After watching the pilot, I was addicted. To watch the first season as fast as possible and catch up, I got the 7 discs from Netflix, Blockbuster Online, and even the last two from my local Blockbuster store (they counted as one rental). To catch up on Season 2, I downloaded a few episodes from iTunes for $1.99 each. I know I could have used BitTorrent to download them for free (illegally), but this gave me an excuse to try iTunes Video downloads. I also set my Windows XP Media Center PC to record Season 2 while I was watching Season 1. I liked the excuse to use several different technologies (that didn't exist a few years ago) to watch an entire season of tv in a few weeks -- legally. A few Lost resources: ABC's Lost Web site, The Official Lost Podcast, a Lost blog, and Lost on the Wikipedia. 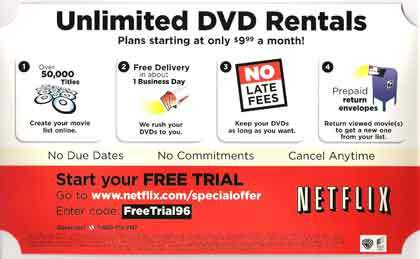 Brent from About The Image tipped me off to another Blockbuster free trial month code for new customers on SlickDeals.net: AMXHOLIDAY. AOL recently made the controversial decision to place large banner ads on AOL Journal sites. 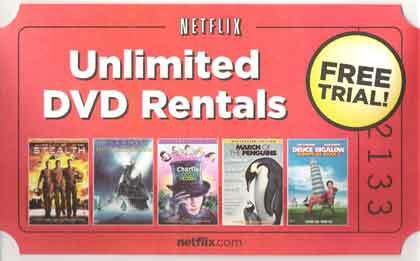 Inside Bay Area ran a story about one blogger who complained about the ads: "Now, her personalized Web page that includes her thoughts about nature and spirituality has become a platform for Netflix DVD rental ads." I visited a number of AOL Journal sites and found ads for a wide range of companies including eBay, Bank of America, American Express, Nintendo, and more. I viewed at least 50 ads, and not one of them was for Netflix. Netflix is one of the biggest advertisers online, but to single them out in this story was wrong. It was AOL's decision to add the banners to the blogs, and to blame Netflix is bad journalism. The December issue of Fast Company Magazine (Robert Rodriguez cover) has a series of stories about "Building a Better Movie Business." They profile the people that are trying to change the industry, small animation studios, international markets, and Mark Cuban. The stories are not online yet, so if you want to read them now you'll have to spend $5 on the print edition. I have had the Harold Lloyd Collection in my queue, in the number one spot, ever since I found out it would be released. Netflix has it as being released tomorrow, so I returned a movie on Saturday, hoping that Netflix would receive it today, and then send me my number one choice. Didn't happen. Did they send me my number two? Nope. 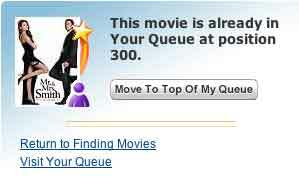 I've had Masculin Feminin in the number two spot for about a month, with "Long Wait" status. Did they send number three? Nope. The Producers has been in the number three spot for about two weeks, also with "Long Wait" status. I have returned 12 titles in the last 30 days, so my top two choices were passed over 12 times (not counting Harold Lloyd, which wasn't released). The Wall Street Journal has a story about the troubling outlook for the movie industry, A Dud at Theaters Will Be a Dud DVD. Some Wal-Mart stores yesterday ran a special in which new DVDs of some summer bombs -- like "Bewitched" and "Kingdom of Heaven" -- were already marked down to the bargain-bin price of $8. It is Hollywood's vicious cycle: when a product underperforms in theaters, it is likely to keep underperforming as it enters DVD, pay television and other ancillary markets. Click here for the full list of new releases for this week (104 movies). Interesting movies include Mr. & Mrs. Smith, March of the Penguins, Deuce Bigalow: European Gigolo, Murderball, Sky High, Their Eyes Were Watching God, King Kong vs. Godzilla, National Geographic: Antarctic Wildlife Adventure, and Project Runway: Season 1. NetFlix does NOT list the names of writers of any of the films on their website, whereas Blockbuster does. We find this kind of disturbing & unnerving, since this is important information, and knowing the writers is one of our favorite selling points about the films that we want to watch! For example, we love movies written by Charlie Kaufman, but there is absolutely no way to find out which movies Charlie Caufman has written by using NetFlix! Not only does it make it impossible for us to find movies by the writers that we like, but it is also disrespectful to the writers who are just as important to a film as the director. Tim Burton's Charlie and the Chocolate Factory is a great example: Blockbuster lists the complete cast, director, writer and producers, while Netflix only shows a partial cast listing and the director. Point: Blockbuster.